Every weekend, children birth through 5th grade experience safe, age-appropriate environments where the Bible is taught in a creative and relevant way. We are passionate about providing a specific place where kids can learn more about God’s love. We would love to see you and your family visit a Church Unlimited location this weekend. Join the fun and experience a world where kids meet Jesus on their level. For nursing mothers and families. Availability depending on location. As you enter a campus, head over to the Kids Unlimited area. One of our friendly volunteers will be waiting to meet your family, check your child into our database system, and lead them to their age-appropriate room. Because we value safety, we will ask for children’s names and birthdates, family members’ names, address, phone number, and any special instructions (allergies, special needs) for your child. The Bible is the most incredible book ever written! We value bringing its stories to life through engaging activities and discussions. We want all children to love God’s Word and understand the value of applying it to their lives. We value building relationships—especially in the small group setting as children relate to their leader and other kids in the group. When families commit to attending the same service each weekend, children build friendships with familiar faces in their small groups. We strive to connect kids to Christ in an environment designed just for them. They’ll learn about Jesus in a fun and exciting way through interactive curriculum and activities. Safety is one of our highest priorities. Every child has a parent-identification number on their nametag, every volunteer is screened with a federal background check, and every hallway is monitored by security personnel. When children have fun at church, they can’t wait to come back. We value creating fun ways for children to learn about Jesus through music, small groups, activities and games. The Connection Zone is a dedicated area for families of volunteers who sit in one service and serve another. This area includes fun games and activities where kids can spend time in fellowship with other Christian families. Your family will have a blast while you serve! Kids Unlimited Palooza is an all-out, crazy fun party where kids enjoy games, prizes, and cash in their Kids Unlimited sand dollars. This event happens during service when the month has a fifth Sunday. Child dedications are a time of public and personal commitment, and are an important milestone for new parents. Parents will make a promise to teach their kids about building a relationship with Jesus Christ. Baptism Class is a special event where we celebrate the decisions children, Kinder through 5th grade, have made to put their trust in Jesus as their Lord and Savior through baptisms. Our annual Kids Camp is creatively designed to give your child the time of their life! Kids having completed 3rd-5th grade may attend. During their time at camp, your child will experience life change with a purpose, building God-given self confidence and character. Each day is packed with team activities that help build strong friendships and let your child have fun in a safe and secure environment. 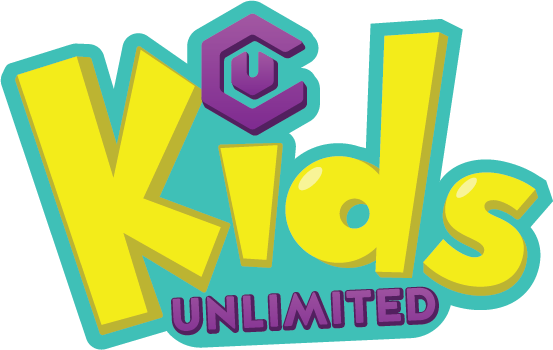 Stay in the loop by following the Kids Unlimited Facebook page. Download the Parent Cue app for fun, interactive ways to engage with your child. There are many opportunities to serve in Kids Unlimited — small group volunteer, service coordinator, master of ceremonies, room volunteer, production/worship, first impressions/registration desk. And after you attend your service and your kid attends theirs, the Connection Zone is the perfect place for your child to hang out while you serve.